Anti-slip tape used to tame “slippery when wet” front entrance. The client was concerned about the danger these slippery tiles posed to employees and visitors. Having worked in this building myself, I have first hand knowledge of how dangerous the tiles to the front door can be when it rains. The steps and landing to the entrance of the office building in Kyalami is finished with sealed Blue Nile Slate tile. 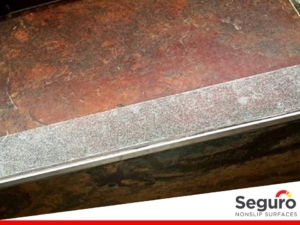 The sealer causes the slate to be very slippery when it rains. The client wanted to keep the sealer on as it highlights the stunning natural colour of the slate so we opted for a clear anti-slip tape to protect employees and visitors against slips and falls on the stairs. 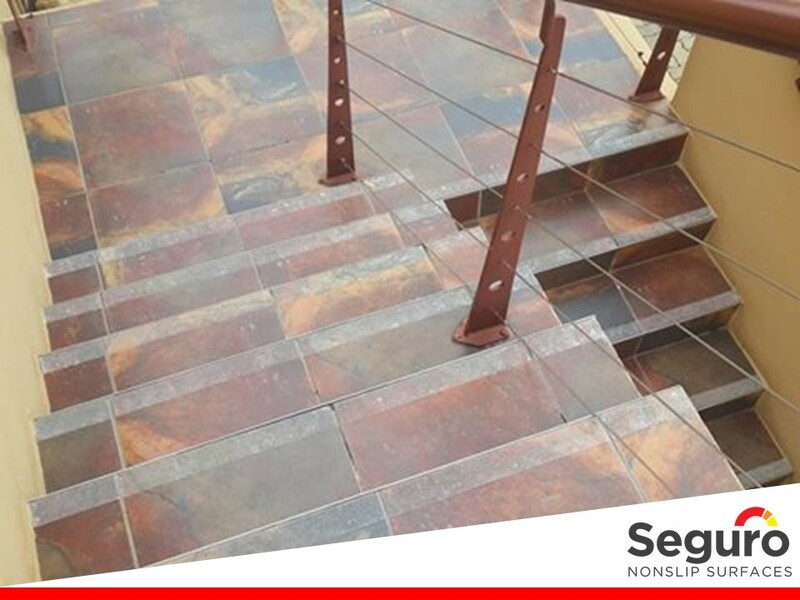 Using the clear anti-slip tape compliments the tile colour and increases the slip resistance on the stairs leaving the entrance safer and attractive.